The 21st annual NATT Teams Tournament will be held at the Gaylord National Resort in Washington, DC for the 5th year in a row. 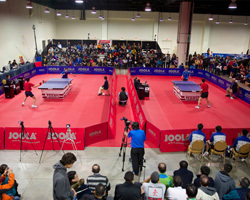 The always highly anticipated three-day competition boasts players from all over the US as well as entrants from around the world, giving players a chance to mingle and learn new techniques from a broader table tennis community. The tournament features a team component in an otherwise individual-focused sport in the US. The first day, Friday, is dedicated to giving players an opportunity to play both higher and lower ranked teams based on original seeding. These results will determine each team’s division placement for the rest of the competition. On Saturday and Sunday, teams will play in a large round robin, facing challenging teams from the same division, as determined by day one. Many competitors will play 25 matches or more over the course of the three days. This gives participants the opportunity to compete against players with a variety of playing styles, but endurance will be a key factor to being successful in this tournament. If players need a break, it’s highly recommended they check out matches from the first division. 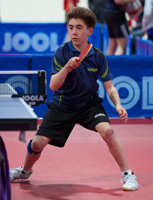 This division invariably includes professional players from both the domestic and international table tennis scenes and the competition is always fierce. All USATT and ITTF rules and regulations will be followed. JOOLA tables & net sets will be used with white JOOLA Prime 40+ ABS balls. No competitor shall wear white shirts or shorts/skirts during play. Entries must be postmarked by Wednesday, October 31, 2018. Any late entries will be accepted on a space available basis with a $100 late fee. If an entry is submitted late, please call to confirm that it was received and accepted. There is a $75 penalty for returned checks. NO REFUNDS after October 31, 2018. All U.S. prize money winners are required to provide Social Security numbers. International prize money winners are required to provide Passport/ VISA. **We are required by U.S. Department of Treasury to withhold 30% tax on all prize money recipients from countries that do not have a treaty with the U.S.